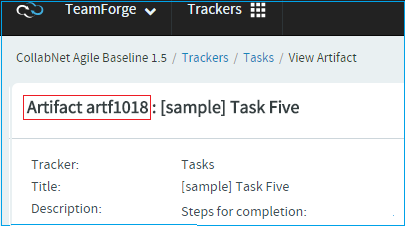 You do not have to be logged into TeamForge to edit a tracker artifact using email, but you must have the tracker edit permission for the tracker containing the artifact you want to edit. Artifacts support @mentions: Artifact description and comments now support @mentions and users called out via @mentions are added to the monitoring list. Include usernames with "@" as prefix (for example, @mphippard) to add users to the monitoring list. Note: Users called out via @mentions must have "Artifact View" permission to be added to the monitoring list.